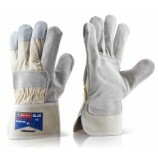 A great range of rigger gloves to suit all budgets. 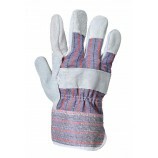 A rigger glove is sometimes also called a 'Canadian' glove or is said to be in 'the Canadian pattern' and is constructed from a leather palm, and usually has a fabric back (often with a leather knuckle guard) and a reinforced safety cuff. 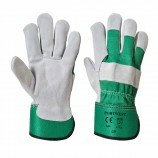 They are usually in a single size, which tends to be generous so they're not a great glove for those with smaller hands. 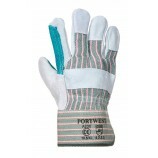 There are a number of ways in which rigger gloves vary and the most obvious in the type of leather used in the construction. Hide leather is usually the toughest - it is literally the outer hide of the animal so is naturally strong. Most styles, particularly cheap rigger gloves, are constructed from 'split leather' - this literally leather where the hide has been split off for some other purpose and the layer underneath is used for the gloves. 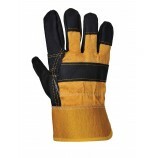 This split leather is then usually tanned or treated in various ways, and the method used affects the toughness and the cost of the glove. 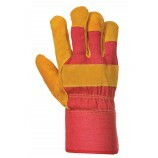 Some hide gloves use furniture hide - this is literally offcuts of top quality leather from sofas, etc. that is used to make the glove. 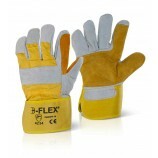 We also provide specialist insulated and hi-viz rigger gloves. 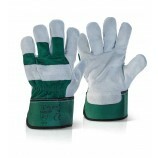 We offer discounts on all our rigger gloves if you buy in quantities - discounts start from just a single pack! If you buy in really big quantities then please contact us for the cheapest possible price. 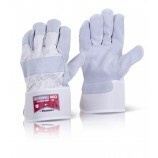 Portwest A941 Disposable PE Glove (Embossed) - 20,000 units.